A spacecraft named Juno hopes to unlock more secrets about the largest planet in our solar system, Jupiter, by studying the planet from its core all the way out to its large magnetic field. The mission’s objective is to help us better understand the origins of our solar system by studying how Jupiter formed. Jupiter is comprised of mostly helium and hydrogen, similar to the Sun, so it is believed that it formed early in the creation of our solar system. It is believed that beneath the dense clouds of Jupiter are clues that will give insights into how Jupiter and our solar system formed. Juno will be able to peer under those dense clouds that shroud Jupiter using its scientific instruments. How much water and ammonia does the planet have? Is there Oxygen present? Is there a solid core at the center of Jupiter, and if so, how large is it? Juno will examine Jupiter’s magnetic field to determine how large it is, how it is generated, and how it affects the planet’s auroras. 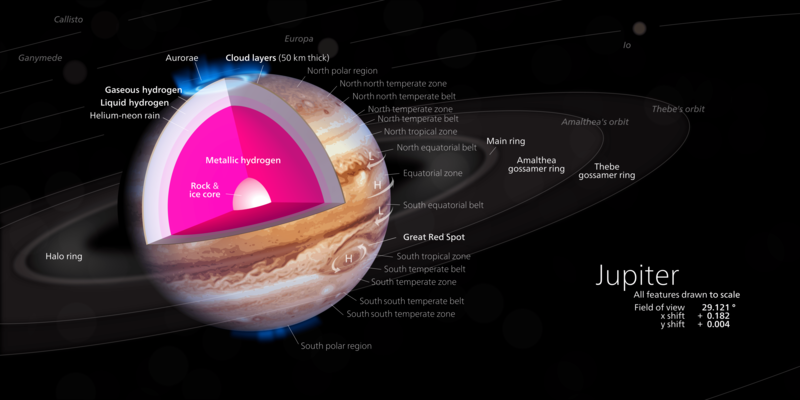 Under the massive clouds tops the hydrogen gas that is a great part of Jupiter’s atmosphere is squeezed under immense pressure until it actually liquefies into metallic hydrogen. The theory is that this metallic hydrogen is the source of Jupiter’s magnetic field and Juno will help determine if the theory is correct. We should also get a good look at the planet’s poles, up close, for the first time. In addition to understanding our own solar system better, it is also hoped that a better knowledge of Jupiter will help us better understand distant planetary systems that are being discovered around distant stars. The name Juno actually comes from Greek mythology. Jupiter was not the most faithful husband to his wife Juno, and thought that by surrounding himself with a veil of clouds he could hide from her. However Juno had the ability to peer through those clouds and see him. Much like the mythical Juno, the spacecraft will peer beyond those cloud tops to unlock the secrets Jupiter has been hiding from us. Juno is not a very large spacecraft at all. The main body only measures 11.5 feet high by 11.5 feet in diameter. However when the three 29.5 foot long solar panels are extended, the span of the spacecraft is more than 66 feet. 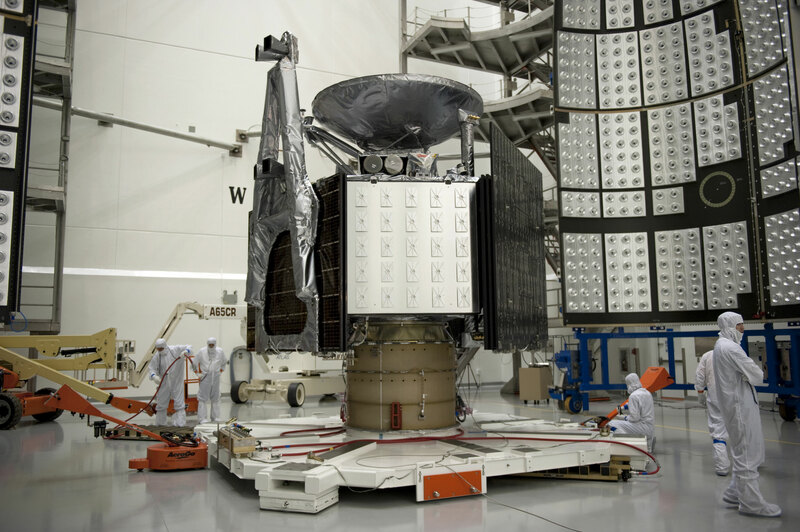 Juno weighs in at just 3,513 pounds but carries onboard an additional 2,821 pounds of fuel and 1,658 pounds of oxidizer, bringing its total weight at liftoff to 7,992 pounds. The spacecraft is designed to rotate during flight like many other previous probes. A rotating spacecraft makes pointing of the spacecraft much easier to control and stabilizes it. Juno will encounter higher radiation levels around Jupiter than normally encountered in space; therefore its sensitive electronics needed a higher level of protection than ever before. A newly designed electronics vault was designed to protect the electronics. The vault is made of titanium; each side of the cube is nearly 9 square feet in area and approximately 1/3rd of an inch in thickness. The titanium cube weighs about 400 pounds and protects Juno’s most sensitive and critical electronics. 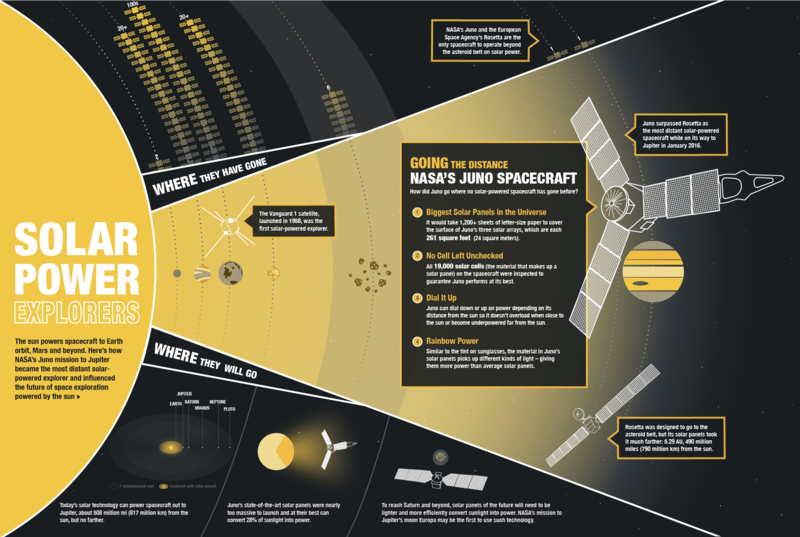 Juno generates its power from three solar arrays of 33 solar panels and three MAG booms. It’s the first solar-powered spacecraft designed to operate so far from the Sun. Sunlight reaching Jupiter is 25 times less than what reaches our Earth, therefore Juno’s power generating panels had to be quite large. Solar panel technology has advanced considerably and Juno’s panels are 50% more efficient than panels flown on spacecraft just 20 years ago. Total power generation from the panels is 14 kilowatts, or 14,000 watts, of electricity when Juno is near Earth, but when operating n Jupiter’s neighborhood, they will only be able to produce about 400 watts. To put that into perspective, the toaster you make your toast in for breakfast uses at least 800 watts of power. 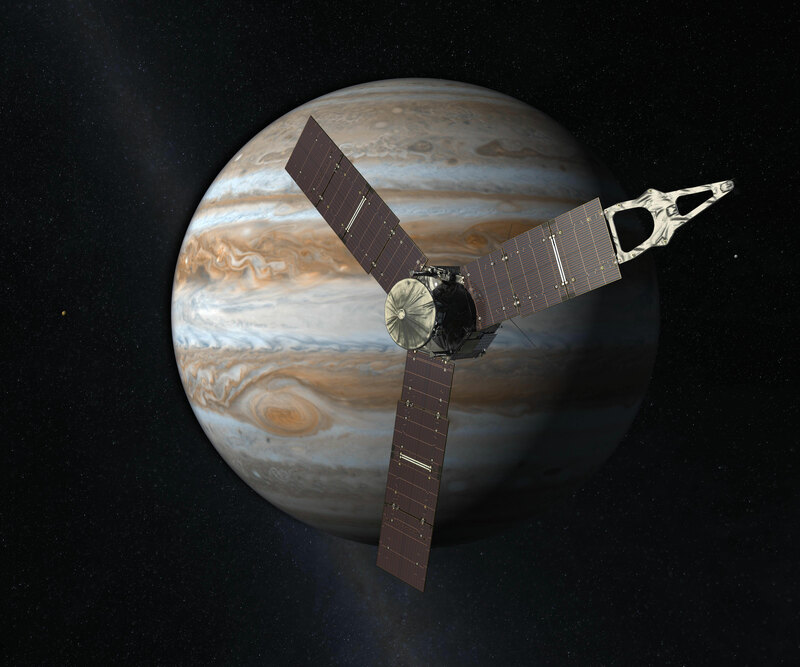 Juno is not a very power hungry spacecraft, so even with the low power output at Jupiter, solar panels were still a viable option for the spacecraft. Its electronics and instruments are very energy-efficient. Add in a mission that avoids Jupiter’s shadow and solar power is completely possible. Once deployed following launch, Juno’s panels remained, and will remain, in constant sunlight except for a few minutes during the Earth flyby. When Juno is in eclipse or not in line with the Sun, two 55 amp lithium-ion batteries keep the spacecraft operating until the panels take over. Juno’s science package consists of 29 different sensors feeding eight onboard instruments, (MAG, MWR, Gravity Science, Waves, JEDI, JADE, UVS, JIRAM), while a ninth instrument, the JunoCam is aboard to generate images for public and educational outreach. The Microwave Radiometer (MWR) will investigate what’s under those massive cloud tops enveloping Jupiter. It can supply scientists with data on the structure of Jupiter’s atmosphere, its chemical composition, how it moves, and do all this down to a depth of approximately 342 miles (550 kilometers) below those cloud tops. The data should tell us how far down those clouds extend from the top, including the Great Red Spot. Comprised of six antennas, MWR will be able to determine how much water is contained within the planet’s atmosphere. In order to ‘see’ what’s under those cloud tops, MWR measures the microwave radiation being emitted from inside Jupiter. 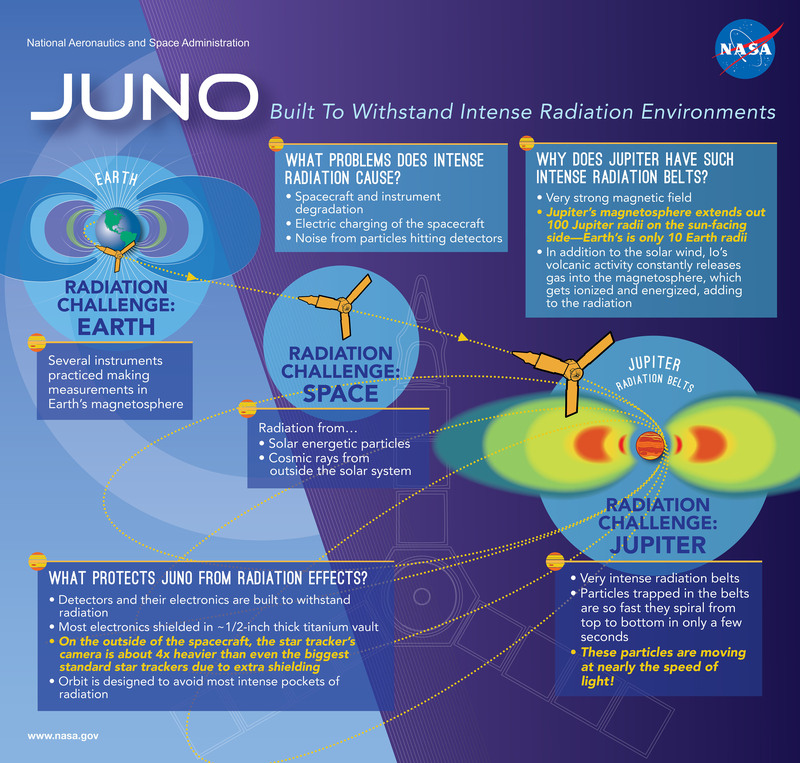 Jupiter’s strong radiation belt blocks any observation of the microwave radiation from Earth, but due to Juno’s low altitude passes, MWR will be able to study them in detail. In order to study the layers under those cloud tops, MWR measures the different frequencies of microwave radiation, MWR can determine from what depth that specific frequency came from since the depth from which radiation can escape depends on frequency. MWR will operate during five of the 32 science orbits when Juno is oriented such that the MWR antennas view the planet directly below during the pass. The Gravity Science (GRAV) experiment is designed to help scientists understand what lies beneath the dense clouds, if there’s a dense core at Jupiter’s center, what makes up the internal structure and how the material inside Jupiter flows. It will do this by mapping the planet’s gravitational field. The GRAV will determine these things out by detecting subtle changes to Juno’s orbit. The orbit will be changed due to variations in the underlying structure of Jupiter. As Juno gets closer to Jupiter, those changes are more easily detected by analyzing shifts in the frequency of a radio signal Juno transmits to Earth and receives back. This cut-away illustrates a model of the interior of Jupiter, with a rocky core overlaid by a deep layer of liquid metallic hydrogen. Diagram from 2014 of Jupiter, its interior, surface features, rings, and inner moons. A 3D renderer was used to make the skeleton for this picture so everything is drawn to scale (except the aurorae). This diagram was drawn precisely to the specifications in the sources used, however scientists weren’t certain if Jupiter had a solid core or if there’s actually such a thing as metallic hydrogen, which remains theoretical to this date. The Magnetometer Experiment (MAG) will create a three-dimensional map of Jupiter’s entire magnetic field that goes all the way around the planet. Scientists using this map will be able to identify Jupiter’s internal structure and how it generates the magnetic field from the constant churning of electrically charged material below the surface. It will also help in the study of Jupiter’s auroras which are created from electrical currents, known as Birkeland currents, which align with the magnetic field and produce the auroras near Jupiter’s poles. Another instrument that will help study Jupiter’s auroras is the Jupiter Energetic Particle Detector Instrument (JEDI). It will study the charged particles, electrons and ions, which travel around Jupiter. Those particles are influenced by Jupiter’s magnetic field and JEDI will determine how much energy they carry, their type, and what direction they are buzzing around Jupiter. Working closely with JEDI is the Jovian Auroral Distributions Experiment (JADE), another set of sensors examining the electrons and ions that produce Jupiter’s auroras. Jade also will contribute to MAG’s mapping of the Magnetosphere. While JEDI measures the high energy particle, JADE measures the low-energy particles. Providing a different look at Jupiter’s auroras is the Jovian Infrared Auroral Mapper (JIRAM). JIRAM will provide an infrared as well as a visual look at the auroras. The instruments can probe 30 to 45 miles into the atmosphere under the cloud tops and should be able to produce maps that will show the interaction between Jupiter’s atmosphere and the magnetic field. Working with JADE and JEDI is the Ultraviolet Imaging Spectrograph (UVS) which will image Jupiter’s auroras in ultra-Violet light. Juno also has an instrument simply referred to as Waves. Waves will measure radio and plasma waves contained in the magnetosphere. A relatively simple instrument, Waves is made up of two sensors, an electric dipole v-shaped antenna which will detect the electric component in the plasma and radio waves. The second sensor is a magnetic antenna, comprised of a small six-inch core with a fine wire wrapped around it 10,000 times. It detects magnetic fluctuations. The last instrument on Juno is not really a science instrument, JunoCam is the spacecraft’s color, visible light-camera designed to take images of Jupiter’s cloud tops. 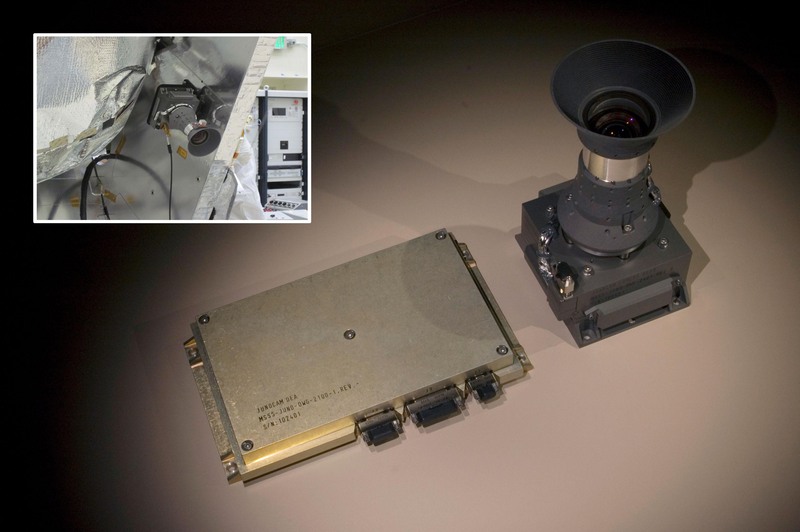 While the wide angle view will help provide context for the spacecraft’s other instruments, JunoCam’s primary purpose is for public engagement. 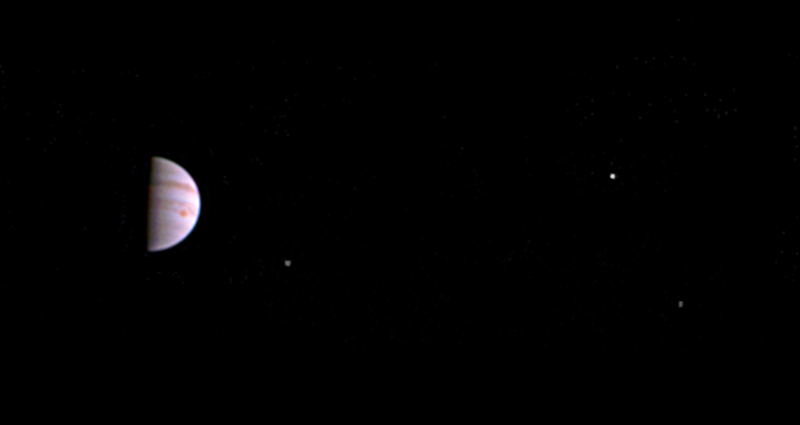 Images taken by the JunoCam will be available to the public via the Juno mission website. Images will be taken mainly while the spacecraft is making its close flybys of the planet, about 3,100 miles above the cloud tops. Remember that Juno is spinning at two revolutions per minute at that point, so images would be blurred if JunoCam took a full image like you do with your DSLR. To solve this issue, JunoCam takes thin strips of an image at the same rate that the spacecraft is spinning, then stitches them together to complete a full image. The camera is mounted on the outside of Juno exposing it to the high-energy particles that surround Jupiter, therefore eventually it will be so damaged by the particles that the team will just shut it down for the remainder of the mission. They expect it to last at least seven orbits, plenty of time for some great imagery to be returned to Earth. Just a few days after Juno entered orbit on July 5, JunoCam was already operating. The first high resolution images won’t be taken until August 27, however it did send down a grainier image indicating that Juno survived its first pass through Jupiter’s extreme radiation. The JunoCam team also has a website where you can talk about the images. You can also vote on points of interest for JunoCam to photograph on upcoming orbit(s). You can also download and process images and then upload them back to the website and see other people’s processed images. Go to https://www.missionjuno.swri.edu/junocam to explore JunoCam community on your own. Juno’s long journey to the gas giant began over five years before its arrival in the Jovian system. 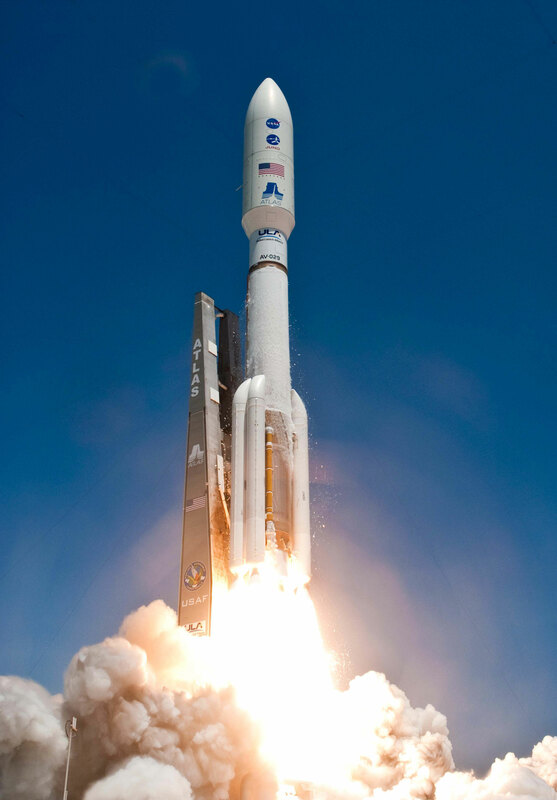 Launching on August 5, 2011 on top of an United Launch Alliance Atlas V rocket from cape Canaveral Air Station. The Atlas V is a powerful rocket on its own, but to get Juno to Jupiter, five Solid Rocket Boosters were added to the launch vehicle to provide more thrust to lift the 7,992 pound (3,625 kg) probe away from the Earth. The trajectory of the spacecraft initially placed it in a heliocentric orbit that took it out past the orbit of Mars before maneuvering to a gravity assist flyby of Earth over two years after launch. On October 9, 2013 Juno skimmed passed the Earth, zipping past us just 310 miles above the surface while gaining speed along the way. The Earth flyby resulted in an increase of 16,330 miles per hour to the spacecraft’s velocity. The probe then shot out of Earth’s gravity heading on a direct path to Jupiter. Getting to Jupiter is no easy task, getting into orbit is even harder. After nearly five years of flight and over 1.7 billion miles travelled, the spacecraft would be approaching Jupiter at an astonishing speed. Juno would have the title of the fastest spacecraft ever with a top speed of over 165,000 mph and would be approaching Jupiter at over 150,000 mph as the giant planet’s gravity pulled it in. If the burn to slow it down to enter orbit failed, it would just scream past Jupiter and keep right on going. However the 30 minute long orbit entry burn did go off as scheduled, and while it only slowed the spacecraft down 1,212 mph, that was all that was needed to put Juno in what is known as its capture orbit. The first two orbits, called ‘Capture Orbits,’ will each take 53.5 days to complete and are used primarily as a way to save fuel as the gravity of Jupiter continues to slow the spacecraft down during these orbits allowing it to get into its planned 14-day orbit of the planet. During this first orbit the science team will check out all the instruments and begin taking some science measurements to ensure all is functioning well with the spacecraft in the Jupiter environment. The Capture Orbit phase of the mission will not complete until October 14. Five days after the Capture Orbit phase of the mission comes what is called the Period Reduction Maneuver. This involves another burn of the engine designed to bring the spacecraft’s 53.5 day orbit around Jupiter down to just 14 days. This time the burn will last for 22 minutes and is the last planned large firing of the spacecraft’s main engine. Due to some unique conditions associated with the maneuver, the spacecraft will have three active science instruments during this phase of this mission. 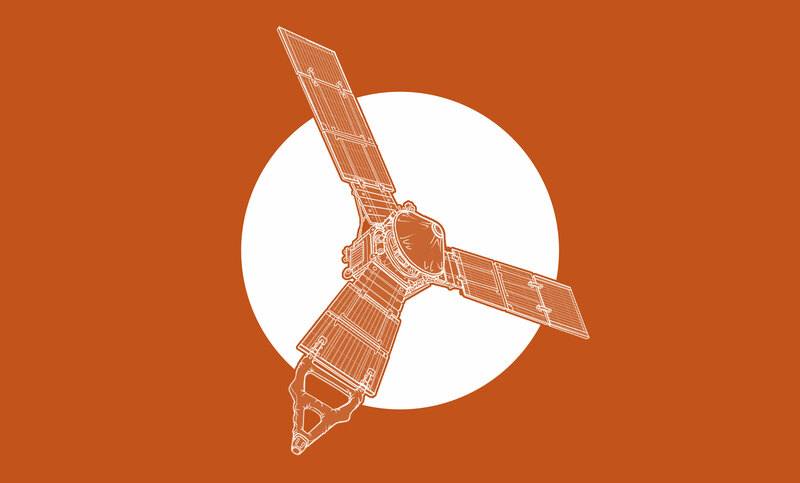 The spacecraft will be at a unique rate of spin and altitude during this phase which should allow the Microwave Radiometer to scan across Jupiter’s longitudes at a high rate. The Advanced Stellar Compass will image Jupiter’s north polar region and darkened atmosphere, while the Flux Gate Magnetometer will gather additional data that may be useful later to fill in potential gaps in the global magnetic field mapping that will occur during the science orbits. Orbits 4 to 36, also known as the Science Orbits, are where the bulk of the science collection will occur. On each pass of the planet, as the spacecraft comes closest to Jupiter, it will make small adjustments to its speed, each less than 18 MPH, to ensure that on the next orbit, the longitudinal track for the closest encounter with Jupiter is where it should be. Each Science orbit will not necessarily fly the same spacecraft orientation as the previous orbit. The reason behind this is to highlight a specific science instrument on that orbit, sometimes it will be the Microwave Radiometer (MWR), sometimes the Gravity Science Experiment (GRAV), it all depends on what science data is predetermined to be the highest priority gathered on the upcoming orbit. Even on orbits not oriented to be a specific instrument’s “prime” orbit, at least some of the other science packages will still operate. For example on a MWR orbit, the spacecraft spin axis is oriented to get the best view of the planet directly below, so the JunoCam and the Infrared Imager/Spectrometer will be collecting their nest data on that orbit, but the Gravity Science experiment will still be operating during that orbit, but with only the X-Band instrument collecting data, the Ka-Band translator (Kat) is off since it requires the spacecraft to be oriented towards Earth. Then on a GRAV oriented orbit, when the spacecraft is oriented towards Earth, the Kat can download data to Earth in real-time, but the orientation reduces the amount of data collected by other instruments. The design of the orbits should allow Juno to cover the entire planet with its instruments, giving scientists a good picture of all of Jupiter from their various instruments. In order to avoid the highest levels of radiation coming from Jupiter’s radiation belts, while still getting the spacecraft very close to the planet to allow the science package to complete the assigned tasks, Juno’s scientists have designed the orbits to be highly elliptical. The spacecraft approaches the gas giant from the north, zipping down over the north polar region of the planet coming in as close as 2600 miles, then comes out from the southern polar region and heads out away from the planet before curving back for another pass. While each science orbit lasts nearly 14 days, most of the instrument observations are taken while Juno passes closest to Jupiter. These close passes are from pole to pole as Juno is flying a polar orbit, and the closest encounters only last around two hours since Juno is still travelling at a very fast velocity, although the instruments are still collecting data during the approach and departure also. The final phase of the mission is called the Deorbit phase. Designed to send Juno into the atmosphere of Jupiter, this will end up in the destruction of the probe as it was not designed to operate in the extreme environment of Jupiter’s atmosphere. After the science pass on orbit 37, a deorbit burn will occur which will set the lowest point of the next close pass to be below the clouds tops. On February 20, 2018 Juno will have completed its mission. The destruction of the spacecraft in Jupiter’s atmosphere ensures that its orbit would never place it on a collision course with the Jovian moons Europa, Ganymede, or Callisto. Such an impact would violate NASA’s planetary protection requirements. As of this writing, Juno is currently in its first capture orbit, speeding back towards Jupiter, the science instruments are on and while the first orbit is not technically a science orbit, some readings, and certainly some images will be gained during the pass around Jupiter. The first actual science orbit doesn’t begin until the middle of November. In the months ahead, more science and images will come back from Jupiter. What will we discover and what will we see?